Star Defender - Bouncer to the stars! 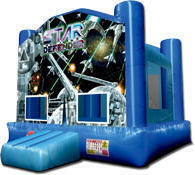 This a great adventure themed bouncer, and a moonwalk that is truly out of this world. Bright, rich starship graphics adorn the exterior and an imagination playscape awaits within. Bridget. "Your staff was kind and helpful when they set it up! They made sure they treated our yard respectfully! In addition you have a GREAT selection to choose from and every bounce house we have rented has been in GREAT condition. They smell great and appear clean and well taken care of! We will continue to call whenever we need bounce house!"